PediaSure Peptide 1.0 Cal is a nutritionally complete, peptide-based formula for the nutrition needs of children ages 1-13 years with malabsorption, maldigestion, and other gastrointestinal conditions. It is for oral or tube-feeding and may be used as the sole source of nutrition or as a supplement. Meets or exceeds 100% of the Dietary Reference Intakes (DRIs) for protein and 25 essential vitamins and minerals for children ages 1-8 years in 1000 mL (1000 Cal) and for children ages 9-13 years in 1500 mL (1500 Cal). Want to know more? 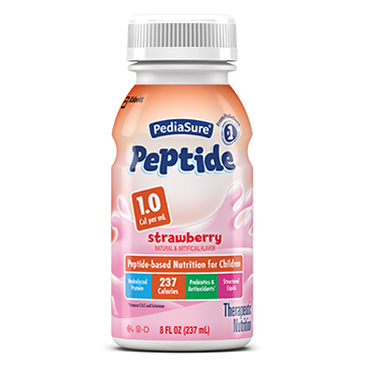 Click on the link below for FAQs about PediaSure Peptide 1.0 Cal. Water, Corn Maltodextrin, Sugar, Whey Protein Hydrolysate, Structured Lipid (Interesterified Canola, Medium-Chain Triglycerides), Medium-Chain Triglycerides, Hydrolyzed Sodium Caseinate. Less than 0.5% of: Short-Chain Fructooligosaccharides, Canola Oil, Calcium Phosphate, Natural & Artificial Flavors, Potassium Citrate, Cellulose Gel, Magnesium Phosphate, Soy Lecithin, Potassium Chloride, Magnesium Chloride, Ascorbic Acid, Carrageenan, Choline Chloride, Sodium Citrate, Cellulose Gum, m-Inositol, Taurine, Sucralose, Ferrous Sulfate, Zinc Sulfate, dl-Alpha-Tocopheryl Acetate, L-Carnitine, Calcium Pantothenate, Niacinamide, Manganese Sulfate, Thiamine Hydrochloride, Pyridoxine Hydrochloride, Riboflavin, Copper Sulfate, Vitamin A Palmitate, Folic Acid, Chromium Chloride, Biotin, Potassium Iodide, Sodium Selenate, Sodium Molybdate, Phylloquinone, Vitamin D3, and Vitamin B12. Water, Corn Maltodextrin, Whey Protein Hydrolysate, Structured Lipid (Interesterified Canola, Medium-Chain Triglycerides), Medium-Chain Triglycerides, Hydrolyzed Sodium Caseinate. Less than 0.5% of: Short-Chain Fructooligosaccharides, Canola Oil, Calcium Phosphate, Potassium Citrate, Cellulose Gel, Magnesium Phosphate, Soy Lecithin, Potassium Chloride, Magnesium Chloride, Ascorbic Acid, Choline Chloride, Cellulose Gum, m-Inositol, Carrageenan, Sodium Citrate, Taurine, Ferrous Sulfate, Zinc Sulfate, dl-Alpha-Tocopheryl Acetate, L-Carnitine, Calcium Pantothenate, Niacinamide, Manganese Sulfate, Thiamine Hydrochloride, Pyridoxine Hydrochloride, Riboflavin, Copper Sulfate, Vitamin A Palmitate, Folic Acid, Chromium Chloride, Biotin, Potassium Iodide, Sodium Selenate, Sodium Molybdate, Phylloquinone, Vitamin B12, and Vitamin D3. Water, Corn Maltodextrin, Sugar, Whey Protein Hydrolysate, Structured Lipid (Interesterified Canola, Medium-Chain Triglycerides), Medium-Chain Triglycerides, Hydrolyzed Sodium Caseinate. Less than 0.5% of: Short-Chain Fructooligosaccharides, Canola Oil, Calcium Phosphate, Potassium Citrate, Natural & Artificial Flavors, Cellulose Gel, Magnesium Phosphate, Soy Lecithin, Potassium Chloride, Magnesium Chloride, Ascorbic Acid, Carrageenan, Choline Chloride, Sodium Citrate, Cellulose Gum, m-Inositol, Taurine, Sucralose, Ferrous Sulfate, Zinc Sulfate, dl-Alpha-Tocopheryl Acetate, L-Carnitine, Calcium Pantothenate, Niacinamide, Red 3, Manganese Sulfate, Thiamine Hydrochloride, Pyridoxine Hydrochloride, Riboflavin, Copper Sulfate, Vitamin A Palmitate, Folic Acid, Chromium Chloride, Biotin, Potassium Iodide, Sodium Selenate, Sodium Molybdate, Phylloquinone, Vitamin D3, and Vitamin B12.